When in the gconf-editor, you need to go to /apps/panel/applets/clock_screen0/prefs and then change the custom_format and format parameters as shown (double-click on a parameter name to change the value). The original information was found in this thread. 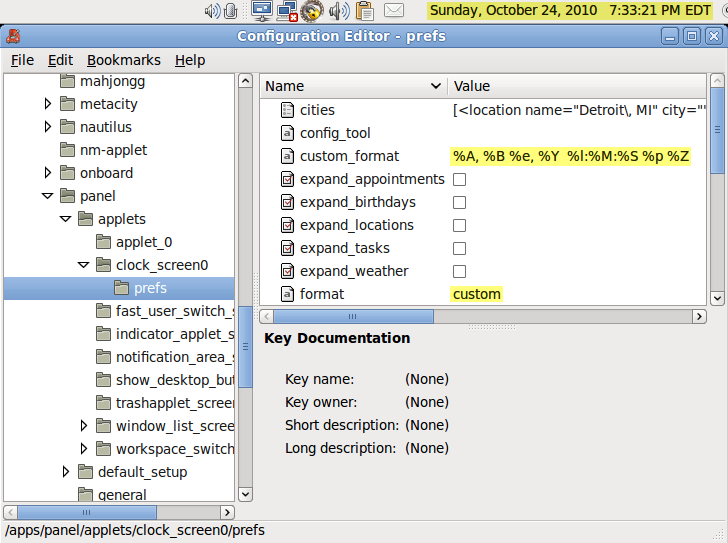 When in the dconf Editor, you need to go to /com/canonical/indicator/appmenu/datetime and then change the custom-time-format and time-format parameters as shown (double-click on a parameter name to change the value — time-format is not highlighted in this screenshot, but you do need to change it to custom). If the seconds don’t change (that is, if they always stay at 00) then scroll down (if necessary) in the prefs list and make sure the show_seconds or show-seconds box is checked. If you don’t like my format and want to create your own, you can find the codes for the various parts of the date format here. 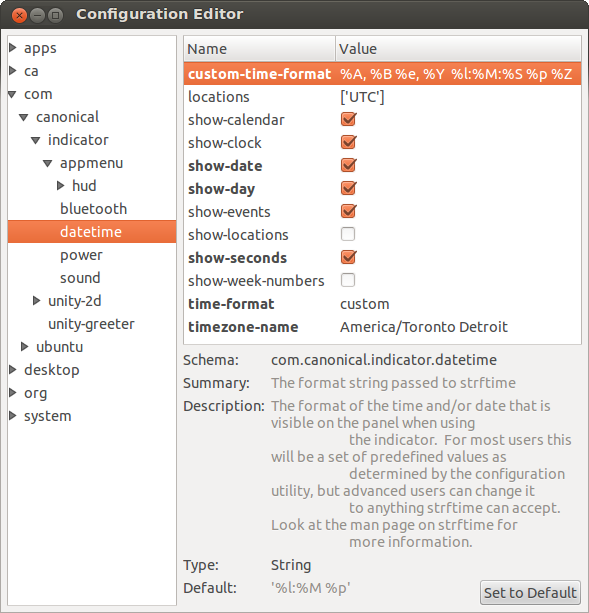 Note that if you are using the XFCE desktop, you need only right-click on the time, select “Properties” from the dropdown, and when the Clock Options come up, select “Custom Format” from the dropdown and then enter your custom format in the text box just below the dropdown. One irritating thing about Google Voice is their voicemail – they must be really proud of it, because they give you no way to turn it off (at least not that I can find), and worse yet, they don’t even let you pick the timeout before your Google Voice calls go to voicemail. If people actually had to pay for their service I’m sure they’d get boatloads of complaints, but since it’s free and since Google doesn’t seem to care much what users think, we are stuck with their voicemail whether we want it or not. However, there are some situations where you really don’t want to have to check Google’s voicemail, so how do you discourage people from leaving a message? The answer is simple, and probably 99.9% effective: Change your greeting to a busy signal! Most people, and even most automated calling equipment, will hang up after receiving a busy signal, and will not leave a message (and if anyone does, it’s probably a stupid robo-caller that you can safely ignore). To start with, download this audio file (right-click on the link and save it to your hard drive). It is 24 seconds of North American busy signal, followed by the DTMF # button (the latter is needed to signal the end of the greeting). Now, the obvious thing to do here is to hold the phone up to your computer’s speaker and play the audio file after Google calls you to record the greeting. If you’re careful about your volume levels it might work, but I don’t recommend it. A better method is to temporarily redirect your Google Voice callback so that it comes to a softphone on your computer, preferably one that has the ability to select audio inputs and outputs. How to do that is left as an exercise for the reader, but I can tell you that the free version of Zopier will allow you to select inputs. 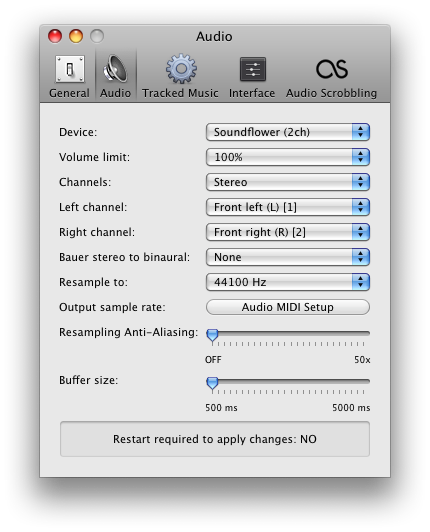 You’ll also need an audio program that can play back .wav files and allows you to select outputs (an example for the Mac would be Vox), and depending on your computer, you may need a third piece of software that allows you to redirect the output of one program to the input of another (for example, on a Mac you can use Soundflower). 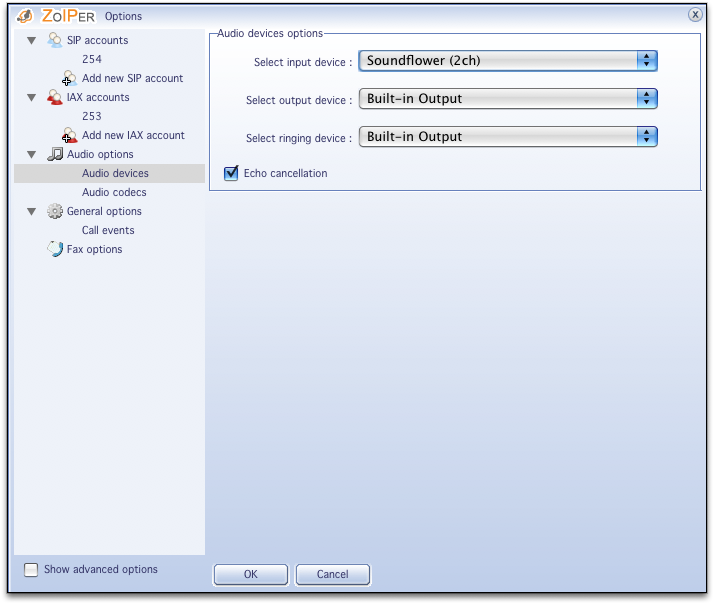 On a Mac you’d go into the audio player preferences, set the output to go to the redirection software, then set the softphone to get its audio input from the redirection software. After doing this, get Google Voice to call your softphone, answer the call and immediately click “play” on the audio player software (into which you will have pre-loaded the audio file) and if all goes well it will play the file and at the end, after the DTMF # tone is played, Google Voice should play back the file, and ask you to accept it or try again. If you hear some ringing tone in the playback prior to the busy signal, just click “2” on Zoiper’s touch-tone keypad to try again (when you are given that option) and then as soon as you hear the beep, click “play” again. When it’s right, click the “1” on Zopier’s touch tone keypad when given the option. You can confirm that this is set as the default from the Google Voice page mentioned above. Also, note that by using the Google Voice “Groups” feature, you can play this “greeting” only to certain callers, if for some reason you want some people to actually be able to leave you voicemail in your Google Voice voicemail box. I know that Zoiper is cross-platform and can be used under all major operating systems, and I’m pretty sure there are audio redirection programs available for Windows and Linux, though I don’t know what they are called offhand (if you do, please feel free to leave a comment, provided the software you suggest is free to use — I’m not going to promote any commercial software for this purpose because I’m pretty sure there is free software available, and in any case, it may even be possible to achieve this function from the Windows sound control panel, but it’s been so long since I’ve tried to do anything like this in Windows that I don’t remember how it’s done, I just know it’s possible). EDIT (2018): This article is extremely out-of-date and in no way useful today, and will probably be removed from this site at some point in the future. You might find this article more useful: How to use Google Voice with FreePBX and Asterisk without using XMPP or buying new hardware. The bonus is that once you get FreeSWITCH installed you can play around with it and look at some of its other features, if you are so inclined. Of course, the Asterisk folks could backport the Google Voice support to previous versions and make it unnecessary to do things like this, but I’m not holding my breath. EDIT (January 26, 2012): The Google Voice channel drivers in Asterisk 1.8 have become unreliable enough (in my personal opinion, anyway) that I just used the technique shown in this article, and I must say that it works a LOT better than Asterisk 1.8’s Google Voice support. I also added some comments to that article (probably too many!) that among other things show how I got it working for multiple Google Voice accounts. So I would now recommend using this method to bridge Asterisk to Google Voice in preference to using Asterisk 1.8’s native channel drivers (unless you are very short on memory and/or storage space) — it just works, and calls connect faster. Read the article AND the comments under it first, so you’ll know what to expect, and do be aware that it takes a relatively LONG time to compile and install FreeSWITCH (compared to Asterisk). At points during the installation it may look like it’s stuck in an endless loop, but it really isn’t. Just go away and take a walk outside or something, and come back in a while and it should be done.